Joe Wells, of whom it has been said. : Another new children's book. I am delighted to report that I have completed yet another childrens book which is now available for purchase on Amazon.co.uk, I shall put the link should any of my delightful readers be inclined to purchase a copy. Sorry, because I live in the UK I forgot all those people in other parts of the world, I should have mentioned the book is also available on other Amazon sites, just enter Sanantha's fantastic space journey and it will come up. 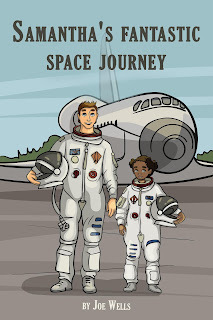 The book is called Samantha's fantastic space journey and tells the story of a young schoolgirl going on a space journey, it is written as are all my books in a slightly old fashioned way, in that it has good manners, morals and aspirational elements to educate the younger person in the correct manner. Do please purchase a copy I'm certain your young children and grandchildren will enjoy it and may I say it is also very reasonably priced, just click on the illustration. Thanking you in anticipation.